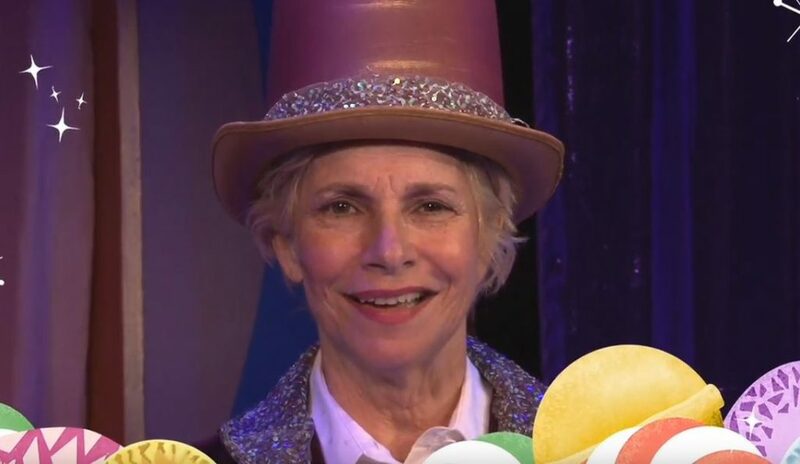 Willy Wonka is getting old and she needs an heir. That’s right. She. “Willy” (intense and mysterious Mary Gibboney) is female in this production of Roald Dahl’s classic, Charlie and the Chocolate Factory, and is usually referred to as “Madam Wonka.” In hopes of finding this heir, she hides five golden tickets in her marvelous chocolate bars, which she sells all over the world. The five lucky winners will be invited on an exclusive tour of Madam Wonka’s secret factory. Four spoiled brats from around the globe are joined by the warm-hearted Charlie Bucket (earnest and endearing Juan Castro), who makes the best of the poverty he lives in. In short, the plot of this play closely follows the book and the movie it inspired. 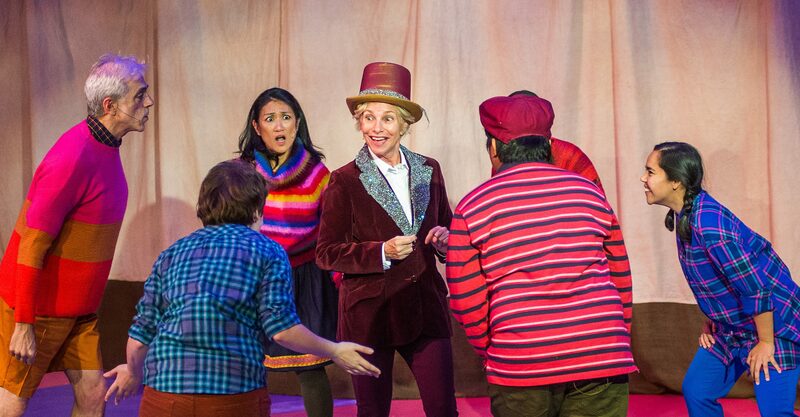 Subtle updates and innovative flourishes pepper this children’s musical. “Adult” characters often wear half comical, half grotesque masks. When we see Charlie’s grandparents lined up in bed under a blanket in these masks, the effect is amusing and nostalgic—with a touch of unease. Although we are reminded of Gene Wilder’s Willy Wonka, Director Michael Mohammed impresses with his creativity and style. In the chocolate factory, actors play the Oompa-Loompas by manipulating waist-high puppets whose feet are strapped onto the actors’ shoes. The puppets come in bright colors and are covered in long fur, almost like a short, squat version of Grover on Sesame Street. The Oompa-Loompas steal the show. Not only are they a visual hit, but as each bratty child succumbs to temptation in Madam Wonka’s factory, they re-emerge from behind the purple curtains as Oompa-Loompas. It’s a great twist, especially since the kids don’t seem to buy that the Oompa-Loompas are refugees, rescued from Loompaland. There is one drawback to sticking so close to the original plot and satirical tone. The dark humor goes over the heads of younger audience members. I didn’t once hear a child laugh. Maybe weaving in more slapstick elements would engage young viewers, who cannot understand much of the dialogue. Or, simply using younger actors to play the children would ingrain the comedy and hook the kids, right off the bat. That said, the energetic singing and dancing, combined with a variety of props, keep the little ones entertained. The show is recommended for ages 5 and up, but my two-year-old daughter was craning her neck every time the lights went down and the actors wheeled things on and off the set. 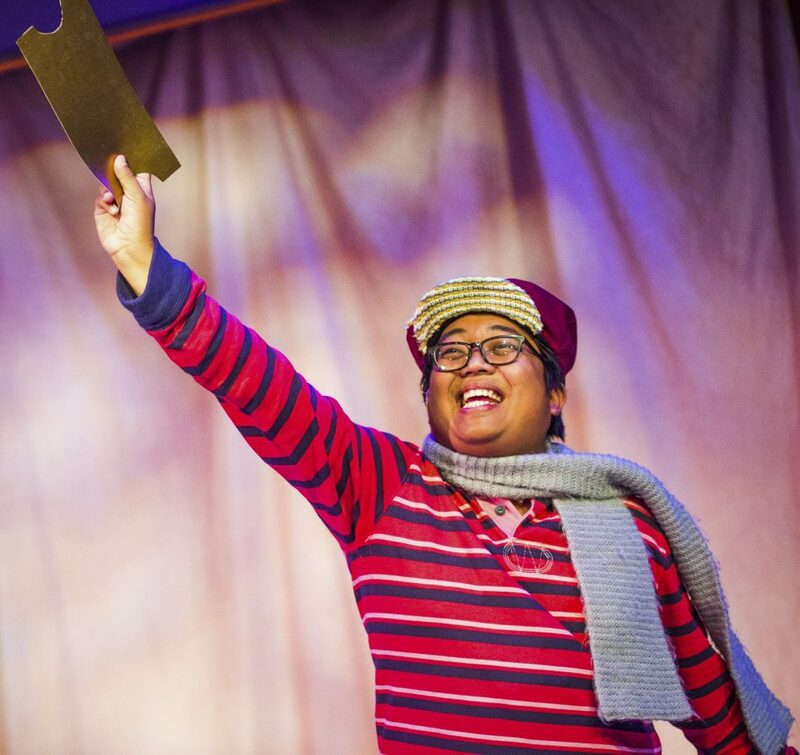 She sat spellbound as Augustus Gloop (energetic Paul Loper), Veruca Salt (sly and temper tantrum prone LeighAnn Cannon), Violet Beauregarde (southern gum smacker Chelsea Wellott), and Mike Teavee (phone and TV obsessed Kailah Cayou) became media sensations for finding a golden ticket. And while (thankfully) she couldn’t understand how the greedy and impulsive kids were disposed of in the factory, she enjoyed the journey so much she started crying and asking for Charlie after the cast took a final bow. Also at: Children’s Creativity Museum, 221-4th Street, San Francisco, Friday, January 5 to Sunday, January 21, 2018. Cast: Pauli N. Amornkul, LeighAnn Cannon, Juan Castro, Kailah Cayou, Mary Gibboney, Paul Loper, and Chelsea Wellott.